I liked this! I had my doubts about this flat iron, which stays at a consistent 365 degrees (to protect strands). As someone with thick hair, I'm used to cranking up the temperature in order to get the stick-straight hair that I desire, so I thought that I'd miss being able to adjust the temperature. However, this worked extremely well. I compared it side-by-side to another straightener with a hig...read moreher temperature, and this still straightened my hair better, and it left my hair looking healthy, not dry or fried. Plus it comes with a nifty carrying case. I like to wear my hair straight pretty much every day, so I've gone through a lot of flat irons in my life. This is by far my favorite -- and the one I reach for every day. 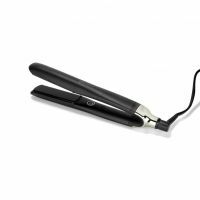 It straightens each strand in one pass, doesn't leave my hair looking parched, heats up so fast and never snags my hair. It doesn't hurt that it's also pretty to look at. I have it in sleek white. While the hefty price tag left me hesitant, I'm so happy I decided to try this flat iron. It smoothed and straightened my hair incredibly well -- and fast. I have incredibly thick hair and I finished styling in under ten minutes. The straightener also doesn't dry out or damage my strands like some flat irons I've had in the past. Definitely one of the best on the market -- and I've tried more than a few.